I am proud of my friends who are writing great books. 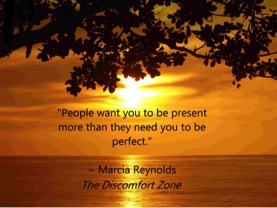 Marcia Reynolds, author of the newly released The Discomfort Zone: How Leaders Turn Difficult Conversations Intro Breakthroughs has written this blog post to encourage us all to be more direct and honest in our feedback. The truth may hurt but it is important to hear if we are going to grow. Whether you are an introvert or extrovert, most people shy away from telling a friend, colleague or family member something that can hurt. The feedback might be as simple as letting a friend know he has lettuce stuck between his teeth or as beneficial as telling your co-worker that her way of criticizing people in meetings is stopping them from hearing her good ideas. Maybe you need to tell your manager that there is a better way to motivate you than what he is doing now. You want to tell people the truth. You rehearse the words in your mind. Yet you still stay silent. If you muster some courage, you share subtle hints, hoping they will understand and fix their appearance or behavior. We are humans who depend on social structures to survive. Therefore, few adults choose to blatantly do something that will hurt people we know. We avoid situations that could cause retaliation, where we are hurt in return. On the other hand, it is likely you want people to tell you the truth even if it hurts. You might get defensive, but once you sleep on it, you realize that if the comments were made with good intent, they were helpful to some degree. So why can’t you do this favor for someone you care about or respect? Trust your inner voice. Your brain is masterful at talking you out of creating uncomfortable situations. Yet your nagging inner voice wants you to speak up. Quiet your brain to hear your voice. Question your fear. What is the worst that could happen? Consider the level of angst you feel now. Could living with the consequences be easier than living with your dread of speaking up? Is it your own embarrassment or face that you are saving more than theirs? If you can, choose to be brave. Then keep your intent of helping in mind as you speak. Be strategic. Unless you are simply informing someone about a clothing or food issue, consider logistics as well as your words. Look for a comfortable and quiet place to talk. Limiting the distractions will help you express care and compassion as you speak. Ask permission. Before you launch into your speech, you might ask the person if they would be interested and open to some observations you have had. If you sense their reluctance, you could ask if they would prefer a different time. Don’t use this as an excuse to back down. Agree on a time in the near future to talk. Clearly describe the impact. A person might disagree with your interpretation of their behavior, but it will be harder for them to dispute the impact they are having on you or other people. Share your intent. Let the person know you are sharing your thoughts because you want them to have something you know is important to them such as their leadership image, collegial respect, or their future success on a project or promotion. Be sincere with what you want for the person so they trust your words. Don’t question your value. If you are being honest and helpful, don’t beat yourself up if the person responds negatively. In the long run, you are developing your personal power as you become more comfortable with giving direct feedback. This entry was posted in Uncategorized on October 13, 2014 by Jennifer Kahnweiler.